I wasn’t feeling too into Halloween this year, and Amber kept pushing me to decide on our costumes. I finally decided to just re-use the Satyr and Fairy costumes we used for Ez’s first Halloween. His costume would now fit Sebs, so I would only have to make a new pair of pants for Ez. After I got the costumes down out of the closet, I actually started getting into Halloween. I took my old Skeksis costume and put it on the Dancin’ Santa I got the day after Christmas. I’ve been meaning to hack it and make it say all sorts of fun things, but I never have time for fun stuff anymore. I put on my Satyr pants, put all the pads in, and decided Ezra needed pads in his costume too this time. Luckily I had a couple of blocks of foam left from last time. I started carving his knees right away. One thing I learned: Babies love razor blades! No matter what I tried, Sebs kept trying to take the razor blade away from me. I finally put him in his highchair with the only thing he likes better than sharp objects: Food! I had a few scraps of fur left from last time, so I brought them over to my mom’s so I could use my sewing machine. I used an old pair of Ez’s sweat pants to make a pattern. After I had my pattern, I laid out the fur to cut it out. One problem; the pattern was about an inch too big to fit on the cloth. It took me almost 3 hours of arranging and re-arranging to finally get it onto the cloth properly. After I got his pants done, I needed to make him some horns. I used sculpy and made a pair that was smaller than mine, but bigger than sebs’s. After looking at mine again, I decided I wanted giant satyr horns, not little faun horns. I would make new ones for myself, give Ez my old ones, and give Sebs the ones I had just made for Ez. So I got a foam wreath holder from Wal-Mart, and sanded it down, making 2 giant horns. I needed something to make them look horny, but decided sculpy would be too heavy at that size. I happened to see some twine in the car on the way to work, and decided it looked a lot like the grooves in the commercial horns I had bought last time. I wrapped the foam horns in the twine, and then used watered down Elmer’s glue to harden it and make it stay in place. They were too heavy to hold on with fishing line like I did last time, so I took one of Amber’s old plastic head-bands and hot-glued them on. They stayed in place pretty well, and my hair was long enough to cover the headband. Last time the hooves I made were pretty crappy. 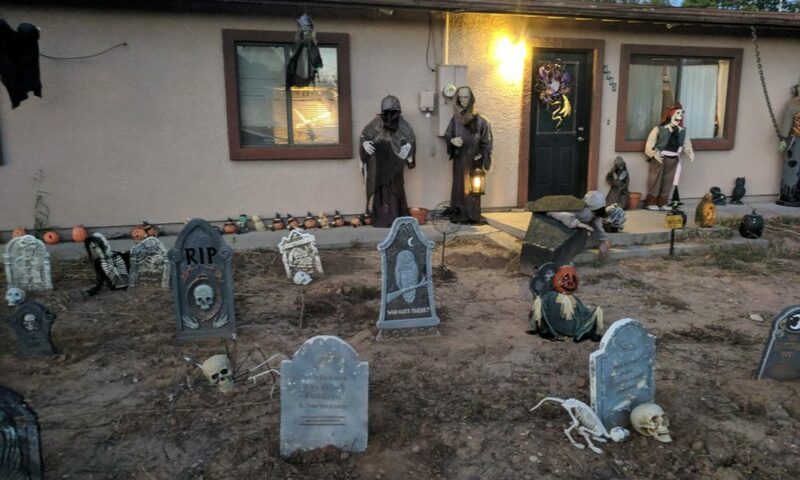 I made them the day before Halloween, and they were just cardboard covered in brown tape. This year I wanted them to look a little more like a real hoof. I still used cardboard for the base, but experimented with different materials to make the bone/fingernail texture. I started with papier maché, but quickly decided I didn’t like the texture that was coming out. I was looking around for a thickener for the glue, but we didn’t have any flour. The only thing I could find was oatmeal. I thought it might give me a good texture, so I mixed some into the water/Elmer’s glue mixture and microwaved it for a few minutes. I decided to forget the paper, and just cover the hooves in this very sticky oatmeal. It came out really cool, but not quite the texture I was going for. I spent a couple of days thinking about what I could use, and kept coming back to sculpy. I knew that it would be too heavy, and very likely to break, but if I could find something like a thin sculpy I could smear over the card board, it might work. Then I remembered the box of dry-wall plaster that’s been sitting in my shed since I moved in. Somehow it was still moist after almost 2 years. I took a hand-full dipped it into a bowl of water, and smeared it onto the hooves. It was just the texture I was looking for. I built up the front of the hooves, making them pseudo-cloven with a crack down the middle. Once they were done I put them in the oven for about 20 minutes. They looked great, but they were bright white. So I took some old coffee grounds and smeared them on. It was just the right color, and had the added bonus of smelling great. I made Ez and Sebs a pair of hooves as well. Since their feet are smaller, I didn’t have to build the plaster up so much, and just used it for texture. That turned out to be a good idea, since their hooves made it the whole night. Mine didn’t. It only took 5 minutes before the tip busted off one of them. I was able to glue it back on, but it still didn’t last. By the end of the night, the plaster was missing from the bottom inch all the way around both hooves. I think next time I’m going to use a foam/latex combo for the hooves, so that they will just bend when hitting the ground, rather than break. Yes, I said next time. Amber has decided this will be a tradition for each of our kids’ first Halloween. So check back for the updated costume in 5 years.